Montserrat Egea was born in Toledo, Spain. She began playing the cello at the age of five, taking lessons from María Casado. When she was eleven, she started studying with Asier Polo, her current teacher at Musikene, Centro Superior de Música del País Vasco. She also complemented her studies receiving master classes from Maria de Macedo, Stephan Forck, Emil Rovner, Enrico Dindo, Peter Bruns and Philippe Müller. Montserrat has already won many prizes. In 2009, she was awarded the 3rd Prize at the Dotzauer Cello Wettbewerb in Dresden. In 2010, she received the award for the Best Performer of Spanish Music at ‘City of Llanes International Competition’. In 2012, she won the 1st Prize at the ‘Intercentros Melómano Madrid’ Competition, then she obtained a 3rd Prize and Best String Player in ‘Intercentros Melómano Spain’. This same year she also won the 1st Prize at the ‘Jaime Dobato Benavente’ Cello Competition, held in Alcaniz (Teruel). 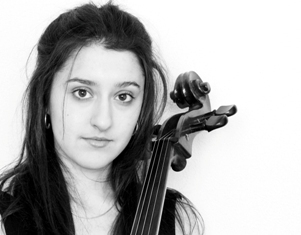 In 2013, she received the 3rd Prize at the Dotzauer Cello Wettbewerb in Dresden. In 2014, she was awarded the 1st Prize at the ‘Jaime Dobato Benavente’ Cello Competition. Recently, she was awarded the 1st Prize and EMCY Prize at the 85th Concurso Permanente de Jóvenes Intérpretes in 2016. You can listen to Montserrat here and also here. If you are interested in working with Montserrat, please get in touch with the EMCY Office. A. Dvorak, Piano Trio No. 4 in E Minor, ‘Dumky’ W.